So you've decided to apply to a startup - taking on the opportunity of growing and building a new organization is amazing! However, working for a startup comes with it's pros and cons, and deciding which companies are worth applying to (and sticking around for) can be a difficult hurdle for any job seeker. Join this Q&A; with Jenn Hall, Director of Talent Acquisition at Metromile, to have all of your application questions answered - and hear how she made her decision to join the Metromile team! What red flags should I be aware of when applying to a startup? I know there are lots of applicants - how can I make my application stand out? I'm interviewing with a really small startup and I can already see that it's not very diverse - should this be a concern? Or should I take this as an opportunity for me to help them diversify? Jenn Hall’s years as a Division I All-American Athlete are some of her fondest memories. 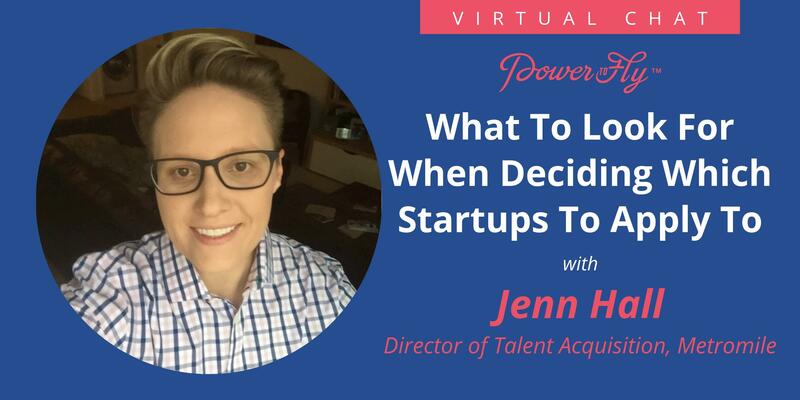 As a lifelong competitor, it was only natural that Jenn was recruited into the challenging field of Technical Recruiting. She has filled countless positions by applying the very same practice methods she used as an Athlete. She has proven experience hiring top talent in an agency, corporate, and start-up environments by executing unique and innovative hiring strategies that are sustainable. Currently, Jenn is the Director of Talent Acquisition at Metromile operating in a player/coach capacity. Her team is focused on disrupting a $250B insurance industry - one hire at a time!